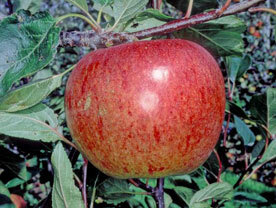 The Coronation apple was raised by H C Princep at Buxted Park and introduced by nurseryman Pyne, Topsham, Devon. It was recorded in 1902 in the year of the coronation of Edward V11 and won an RHS Award of Merit in 1902. It is currently cultivated as part of Brighton Permaculture Trust’s -:- National Collection in Stanmer Park, Brighton. You can see a Coronation apple tree (planted 2011) in Home Farm Orchard, Stanmer Park ( map). The Coronation is a large, handsome apple which can be variable in size and flat to almost conic in shape. The yellow skin is flushed orange-red and streaked with dark red. There is some russet at the base of the apple. It has soft, coarse flesh with a sweet, light taste. Fruit ripens in mid September and will store until November, though it becomes very soft. The Coronation is a vigorous growing tree.